A giraffe can live quite a long time, averaging 20 to 25 years in the wild and 28 or more in captivity. A giraffe can live longer in captivity as it does not have predators and receives regular medical care when sick. Female giraffes can begin to have offspring at 5 years old, which takes 15 months until the new baby giraffe is born. With their extraordinarily long necks and eye-catching spots, Giraffes are some of the striking animals on the planet. The lifespan of a giraffe varies between those which live in the wild and those which live in captivity. A giraffe generally lives a little longer in captivity than in the wild. Wild giraffes typically live about 15 to 25 years, depending on the individual and the species. In captivity, giraffes can live a while longer, between 32 to 40 years overall. To discover why this is the case, it would help to take a closer look at the biology and lifestyle of the giraffe. 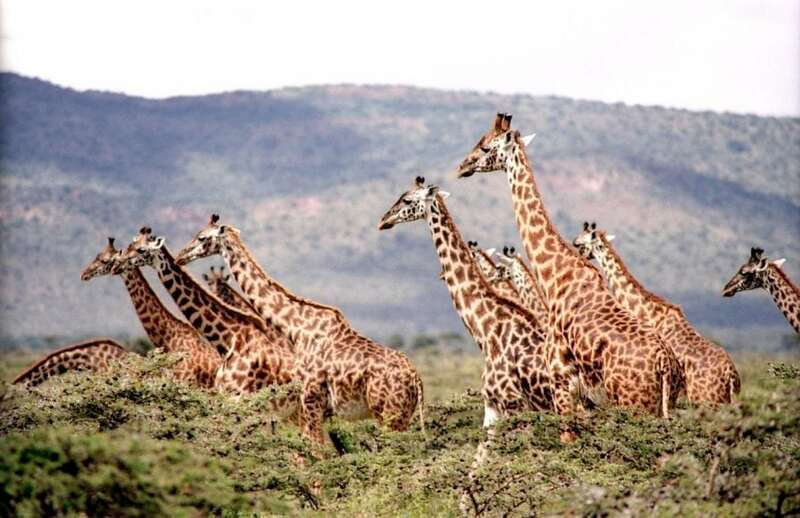 The International Union for Conservation of Nature (IUCN) currently recognizes one species of giraffe with nine subspecies, though this is controversial, and some biologists recognize as many as eight different species. Regardless of how one categorizes the species of giraffes, Giraffa as a whole can be found in various distinct populations throughout almost the entire African continent. The known species, or subspecies, include the Kordofan Giraffe, Nubian Giraffes, West African giraffes, South African Giraffes, Angolan giraffes, Masai Giraffes, and Thornicroft’s giraffe. Giraffes are anywhere between 4.32 5.7 m tall, or 14 to 18.7 feet tall. Males, in general, are taller than females. Much of this height comes from the long neck and legs of the giraffe, as the body itself is relatively small. The legs of giraffe, though spindly looking, are surprisingly robust, as they must be to support the substantial weight of the animal (the average weight of an adult giraffe is about 1190 kg or 2620 pounds). Giraffes can reach a top speed of about 60 km an hour (37 mph) and are capable of sustaining a speed of about 50 km an hour (31 mph) for up to several minutes and over a few kilometers. The long neck of the giraffe can be anywhere between 2 to 2.4 m in length or 6.6 to 7.9 feet in length. Each cervical vertebrae is about 28 cm (11 inches) long to enable this substantial length. A cluster of nerves, like the vagus nerve and recurrent laryngeal nerve, run through the neck down into the body. This complex system supports a long prehensile tongue that gives a giraffe even more reach, enabling them to pluck food from even the tallest trees. Giraffes live on the savannas of Africa, as well as sections of woodland. 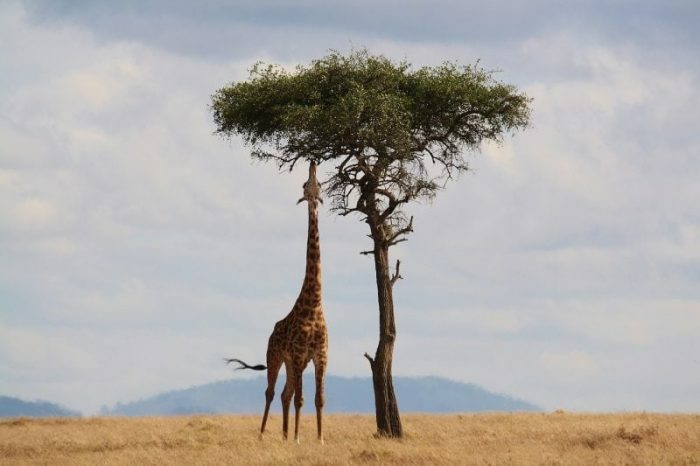 Giraffes like to eat Acacieae, Commiphora, and Terminalia trees, as well as certain fruits and grasses. Giraffes herds change their behavior along with the seasons, spreading out to take advantage of the more abundant greenery during the wet season and clumping around remaining vegetation during the dry season. In terms of reproduction, the gestation period of a giraffe lasts anywhere between 400 to 460 days. Giraffes typically only birth one calf of the time. A calf is capable of running around only a few hours after they are born, though most of its first few weeks alive will be spent hiding and nursing from its mother. The mortality rate for young giraffes is fairly low when compared to some other grazing animals on the African savanna. Yet only around one quarter to one-half of giraffes will reach adulthood. There are a variety of threats to the health and life of Giraffes. Though not frequent targets for predation due to their size, superior senses, speed, and ability to perform dangerous kicks, giraffes are sometimes preyed upon by other animals. 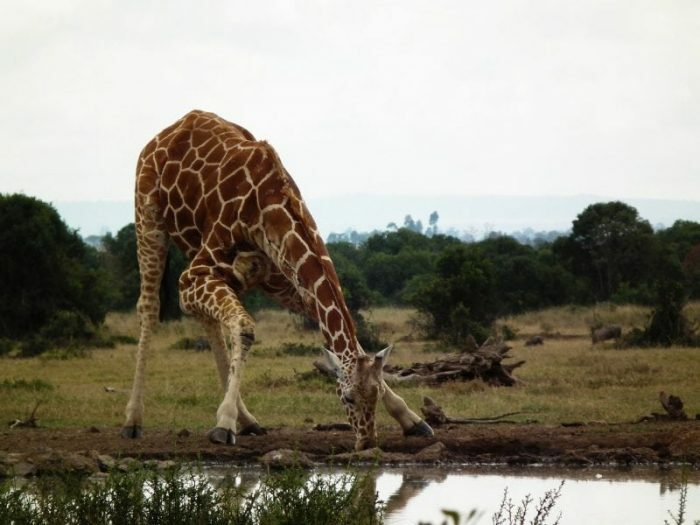 Lions and other big cats may prey upon individual giraffes, and Nile crocodiles may attack them when they drink at riversides. Because of the relative vulnerability of calves compared to adults, young giraffes are often preyed on by hyenas and wild dogs in addition to big cats. Predator attacks frequently kill around half of all calves in a herd. Calves are more likely to survive if born during the dry season, as opposed to the wet season. This may have to do with the fact that mothers who conceive during the rainy season will have a greater accumulated store of energy during the dry season, and the fact that less vegetation means less stocking cover for predatory animals. In addition to predatory animals, giraffes must also deal with diseases and parasites. Bloodsucking creatures like ticks frequently feed on giraffes, which may drain them of energy and leave them more vulnerable to predators. Giraffes often have symbiotic relationships with other animals (birds like the red-billed oxpecker), which clean them of ticks and other parasites in exchange for meals. Giraffes are also susceptible to different diseases and internal parasites, often ingested through water. These include nematodes and flatworms. These parasites can cause skin disorders, leading to lesions or fissures in the skin, which can lead to other infections. It’s suspected that skin diseases may affect almost three-quarters of the giraffes in Ruaha National Park. Other threats to giraffe populations in Africa include hunting and habitat destruction caused by humans. Various body parts of the giraffe were traditionally used to make things like sandals and drums, while the meat of the giraffe was consumed as food. Sport hunting of Giraffes began sometime in the late 19th century. Habitat destruction for the purposes of creating grazing land for livestock and harvesting wood has placed a strain on giraffe populations. For these reasons, most giraffe populations have been given a status of “vulnerable” by the IUCN. It’s for all of these reasons that giraffes tend to live a little longer in captivity than in the wild. Captive giraffes are obviously not in danger of falling prey to wild animals, and zookeepers will usually look after their general health, helping keep them free of parasites and diseases which would threaten them in the wild. In order to help protect wild populations of giraffes, the IUCN does both aerial and ground surveys of giraffe populations. The surveys provide conservation groups with data about which populations of giraffes are the most threatened, so that action can be taken to protect them. Countries like Tanzania have protected the giraffe by law, and in 2017 the UN Convention of Migratory Species chose to provide special protections for giraffes.